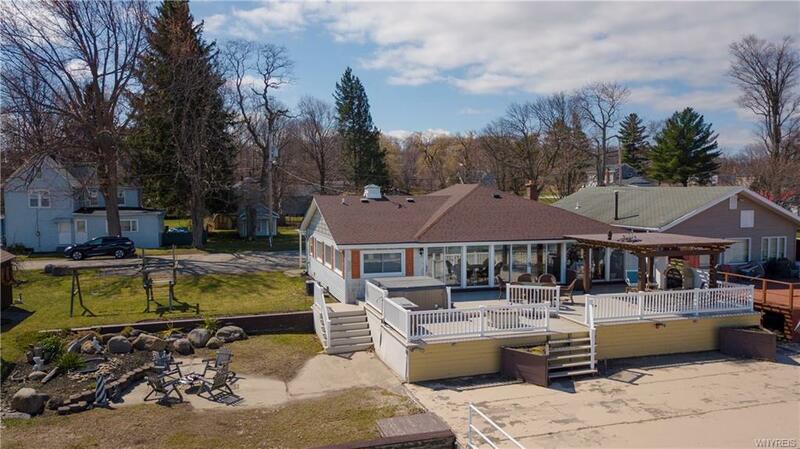 8 Front Street, Silver Creek, NY.| MLS# B1184278 | Chautauqua Lake Real Estate Services. Informed, Professional Real Estate Information Serving Buyers and Sellers Interested in Lake Chautauqua Real Estate and Chautauqua County NY Real Estate. Rick and Julia McMahon Real Estate Advantage Since 1992. Gorgeous lakefront views of Lake Erie! This ranch features 3 beds 2 baths, great open floor plan with high ceilings. Abundance of natural lighting throughout the home, an entire wall of glass sliders viewing the lake. Updated over-sized stretched fireplace to take off the chill in the evening or early morning sunrises. The mstr bdrm has an a joined walk in closet w/ main bath connected to the master. Main bath includes marble floors, double sinks & jacuzzi tub. 1st floor laundry w/ mud area. Soak up the sun or entertain your largest parties on the 1000 sqft vinyl deck,continue down onto 2500+sqft concrete deck with break wall. The property has additional green space with fire pit area & shed. Small public park with beach access is this home's neighbor. Some updates incl : roof 16',deck 10', furnace/AC & windows 10'. MUST SEE! Directions To Property: Rt. 20 Or Rt 5 To Central. Right Turn Onto Jackson St., Left Onto Front St. Property Is Next To George Borello Park. Nearest Cross Street: Jackson St.